A series of Chandra images has allowed scientists to trace the evolution of large-scale X-ray jets produced by a black hole in a binary star system. As the schematic shows, gaseous matter pulled from a normal star forms a disk around the black hole. The gas is heated to temperatures of millions of degrees, and intense electromagnetic forces in the disk can expel jets of high-energy particles. 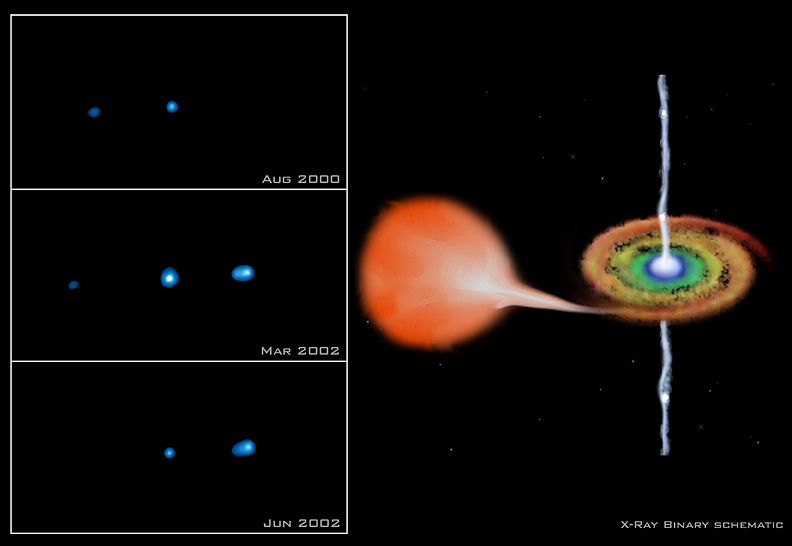 An outburst of X-rays from the source, XTE J1550-564, was detected by NASA's Rossi X-ray Timing Explorer (RXTE) in 1998. 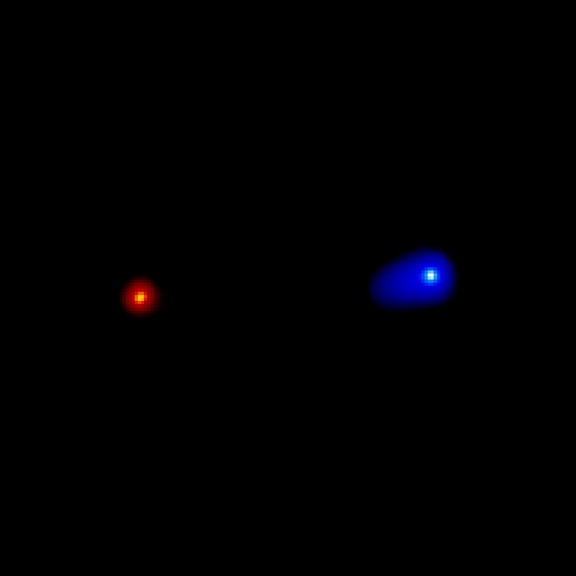 Further observations with Chandra and radio telescopes detected first one jet (left), then another opposing jet (right) of high-energy particles moving away from the black hole at about half the speed of light. Four years after the outburst, the jets had moved more than 3 light years apart with the left jet slowing down and disappearing. The observations indicate that the jet on the left is moving along a line tilted toward Earth, whereas the jet on the right is tilted away from Earth. This alignment explains why the left jet appears to have traveled farther from the black hole than the jet on the right, and why the left jet faded first. However, with this alignment, the relative brightness of the right jet is difficult to understand because it is receding, and should be dimmer than it appears. One explanation is that it is plowing into a dense cloud of gas. The resistance of the gas would slow down the jet, and produce a shock wave that could energize the electrons in the jet, causing it to brighten. The observed cometary shape of the right jet indicates that it is in fact interacting with interstellar gas. The ejection of jets from stellar black holes and supermassive black holes is a common occurrence in the universe, and appears to be one of the primary ways that black holes inject energy into their environment. Although all jets are assumed to decelerate because of the resistance of the gas through which they move, the process can take millions of years for jets from supermassive black holes. The XTE J1550 jets are the first ones caught in the act of slowing down. During the past four years astronomers have observed a process that would take as much as a million years to unfold for a supermassive black hole jet. This underscores the enormous value of studying black holes in our galaxy such as XTE J1550. Coordinates (J2000) RA 15h 50m 58.9s | Dec -56° 28´ 35.30"
References Corbel et al. Science Oct 4 2002: 298, 196-199.